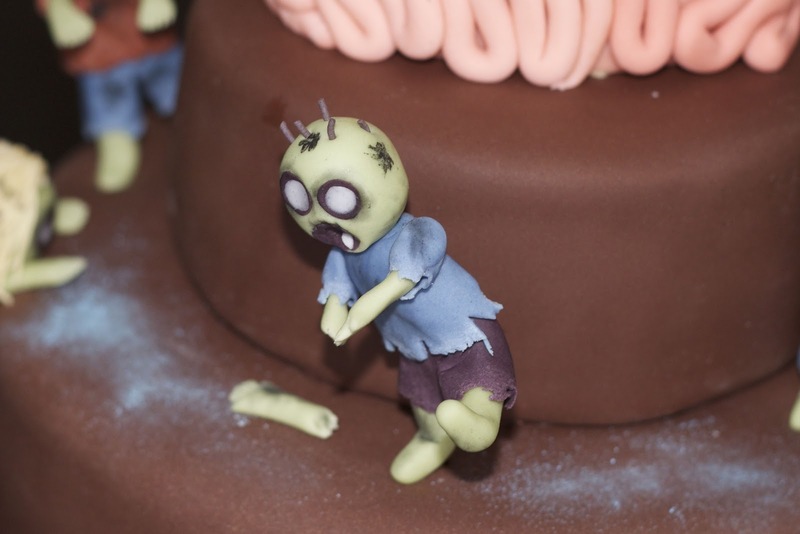 Zombies have taken over birthday season. 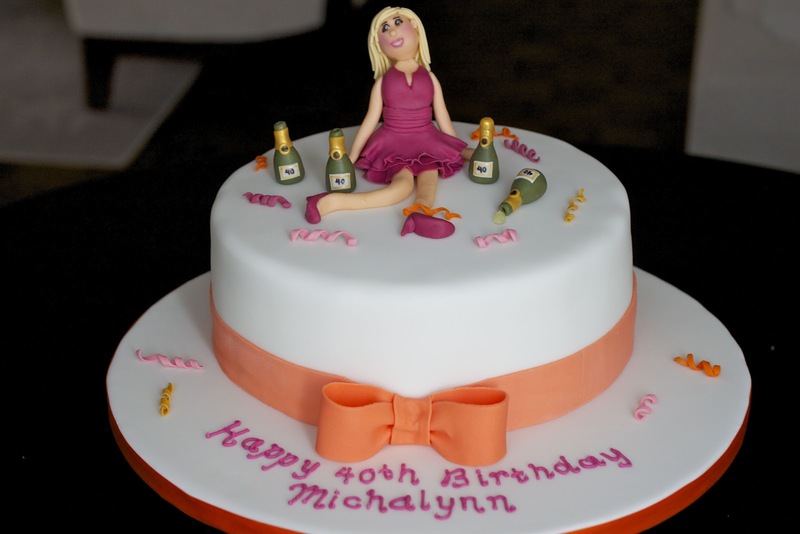 I am always looking around for inspiration for cake designs - books, stationary, tableware, textiles, you name it. 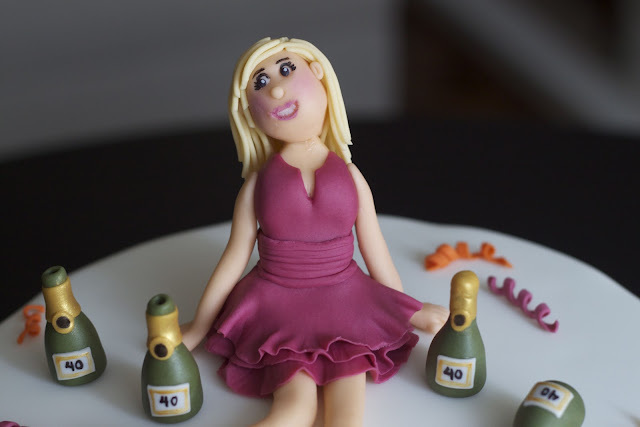 For my birthday, I had initially intended to make a feminine, elegant and pretty cake. My husband and I have birthdays that are 1 week apart, so we decided to have one joined get together. Since we were doing a joint party, I decided that the cake should reflect the two of us. Enter...zombies? We have a bit of a thing for graphic tees. 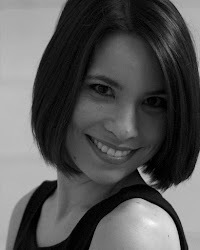 One of my favourite designs that my husband has is called 'Acquired Taste' by Patrick Spens. I recently saw my husband wearing that shirt and thought to myself, 'that would make a really cute cake'. It features a group of zombies longing for a brain meal, while one loner zombie is left behind just wishing he could have a sandwich. I enjoyed making these zombies, especially because the less 'perfect', the better and more zombie-like they looked. 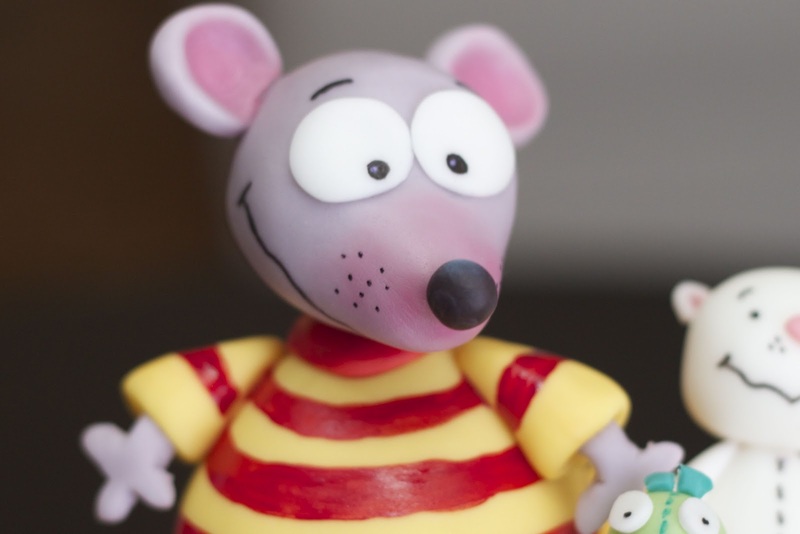 The characters and clothing are made with modelling paste. The 'dirt' is black petal dust mixed with a little confectioner's sugar and the little hair spikes are made from gumpaste. 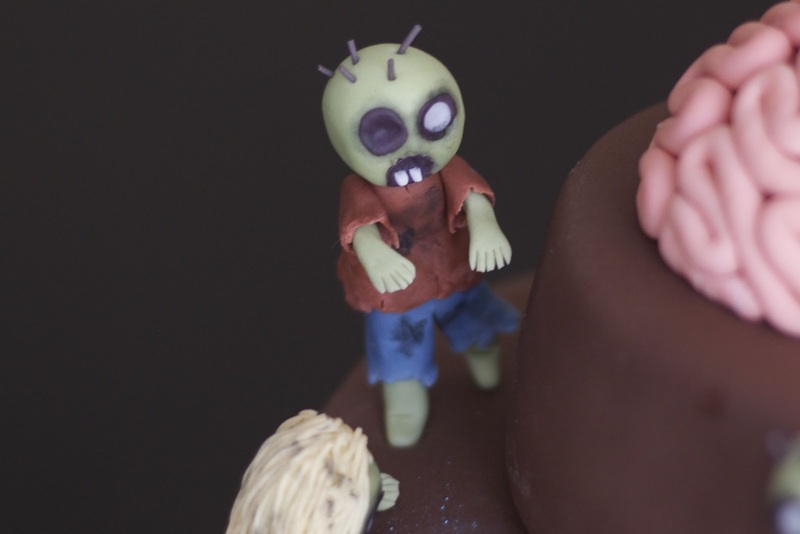 In order to support the characters in standing and walking positions on the cake, I allowed them to dry with a long piece of spaghetti inserted into one or both legs and then inserted this into the cake. I typically try not to use anything inedible in my cakes, but if I had been transporting this cake, I probably would have used wooden skewers instead. 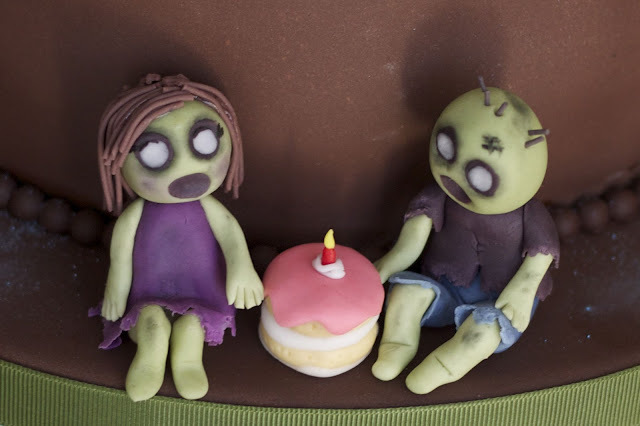 Rather than making one lonesome zombie wishing for a sandwich, I made zombie versions of my husband and I, sharing our birthday cake. I initially designed them to be holding hands, however I did not have a large enough cake board on hand, so their wasn't enough room to have them holding hands with the cake in front. 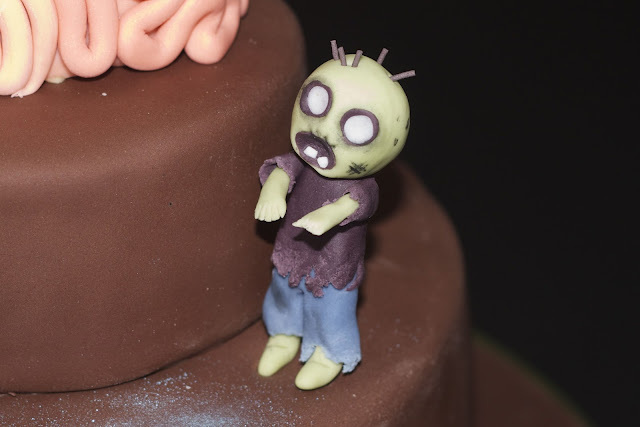 I used grosgrain ribbon for the cake board instead of satin as I didn't think a shiny satin would really go with a zombie cake. The brain is made from Rice Krispies and covered in modelling paste. For the cake, I made a mocha cake with dulce de leche swiss meringue buttercream which was the flavour of our wedding cake. The cake recipe was from Martha Stewart Weddings. 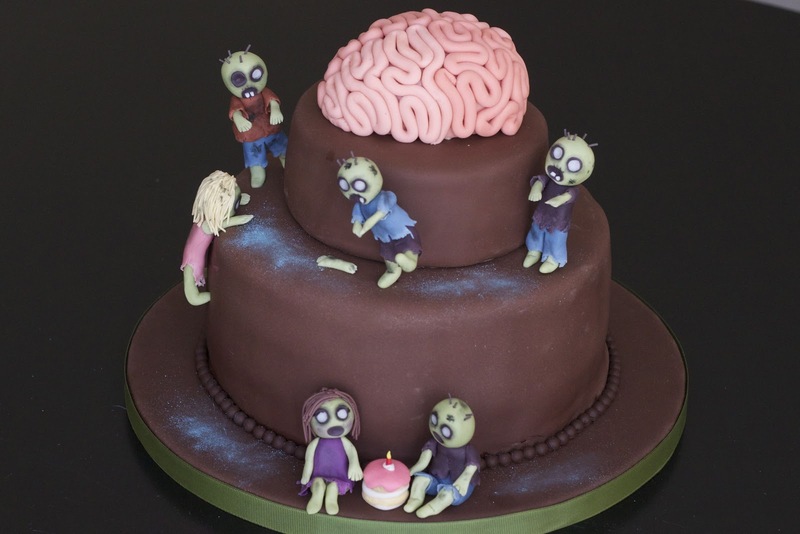 I halved the recipe and this was enough for an 3-layer 8-inch cake, and a 2-layer 5 inch cake (I made a shorter top tier so that the brain was within reach of the zombies). I had a little leftover batter and this was enough for 12 mini cupcakes. For the buttercream, I used about 1/2 cup of dulce de leche and beat this into about 8 cups of vanilla swiss meringue buttercream. The cake is covered in chocolate fondant. We had a lovely birthday get-together with our families. 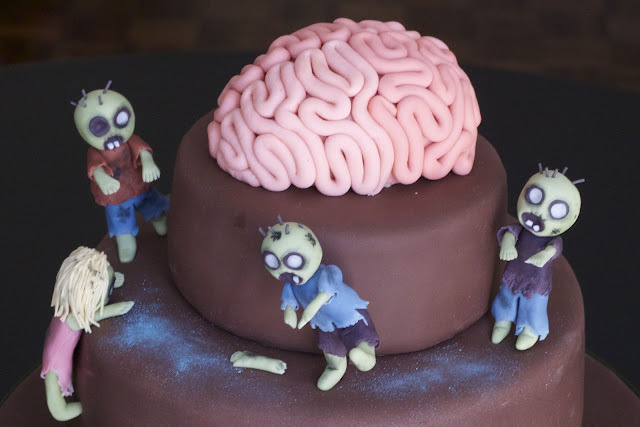 They seemed to enjoy the cake theme as did my oldest nephew - he took the brain home (I know which side he's on....). Birthday season continues with a Care Bear themed cake for my nephew's 3rd birthday. 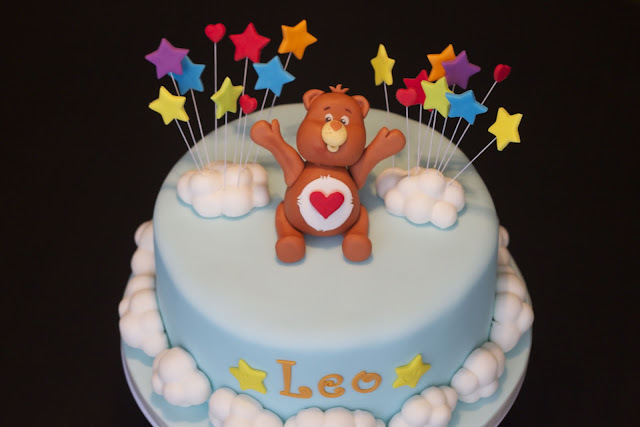 My sister-in-law did not really have a theme for my nephew's party but thought that she would somehow work in the Care Bears since he loves them. She gave me a list of care bears that he would recognize. 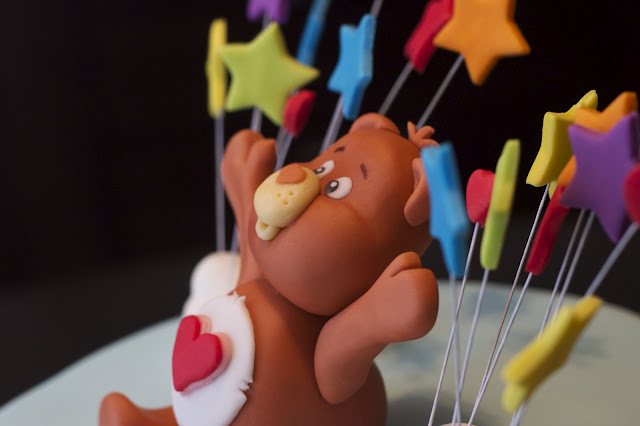 I chose to make Tenderheart Bear for the top of the cake. I decided to fashion his arms in a cheery 'Happy Birthday!' type pose, however, with the direction of the eyebrows my husband felt that it looked more like he was being held up. He suggested that I make some bandit bears to accessorize the cake. Unfortunately for my husband, I didn't think the bandits would fit the birthday theme and I also didn't have time to make any extra bears. 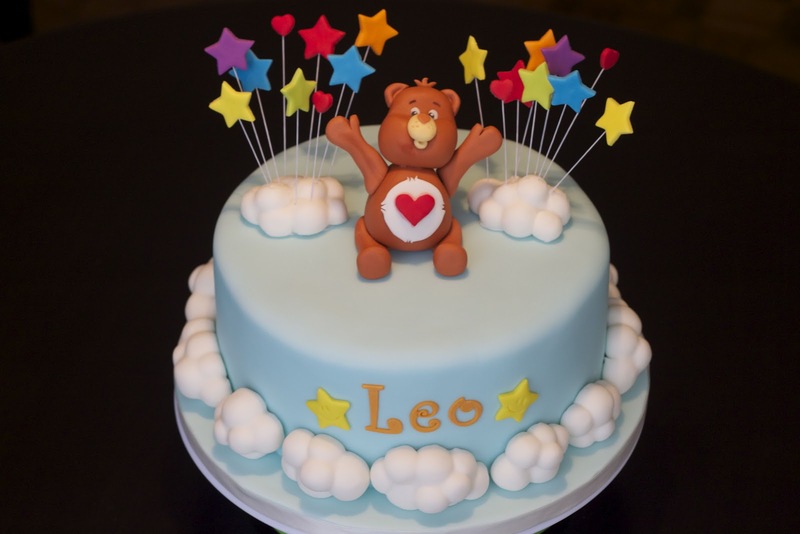 What are the Care Bears without the abundance of clouds and stars and rainbows a-la-Care-a-lot? I framed Tenderheart Bear with rainbow-coloured stars dotted with a couple of hearts. 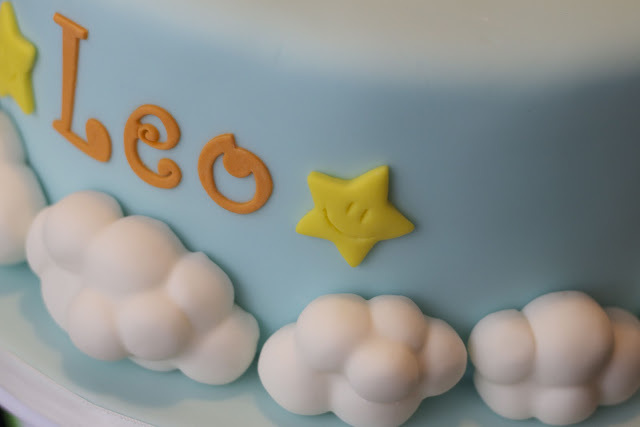 I surrounded the border of the cake with various sizes of clouds made from fondant. It took quite a bit of fondant to make the clouds and it made the cake quite a bit heavier than a typical 9-inch cake. The most fun part of the cake was the inside. It was difficult to get a good picture of it at the party and it's much neater for pictures if you cut a cold cake (not so good for eating though), but you can get the idea. It was 6 thin layers of vanilla cake filled with lemon swiss-meringue buttercream. 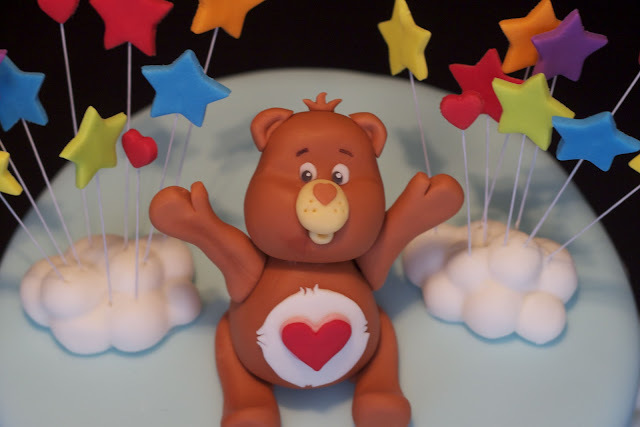 I got the idea from Sweetapolita's Rainbow Doodle Birthday Cake and thought that it would be perfect for a Care Bear Cake. I used the cake recipe from the website but made my swiss meringue buttercream using fresh lemon juice and a few drops of lemon oil versus lemon extract. 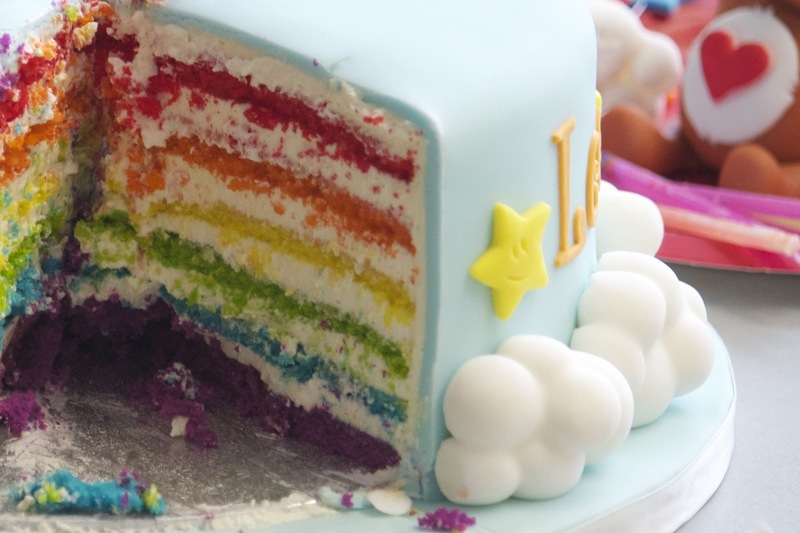 The layers of buttercream are almost thicker than the cake layers! The kids (and adults) loved the bright colours of the cake. While making this cake, my husband put on a Care Bears movie for me to watch on my iPad. It brought back many happy childhood memories. 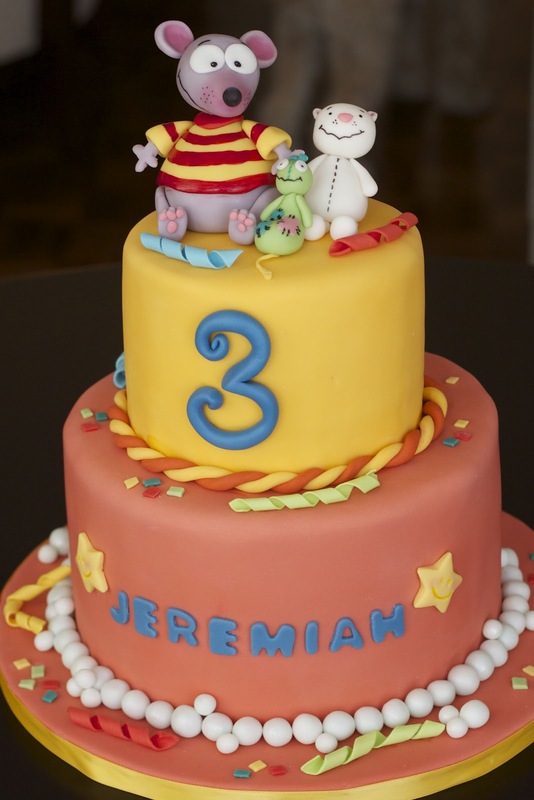 This is such a wonderfully cheerful cake for a 3rd birthday and I hope that my nephew enjoyed it! 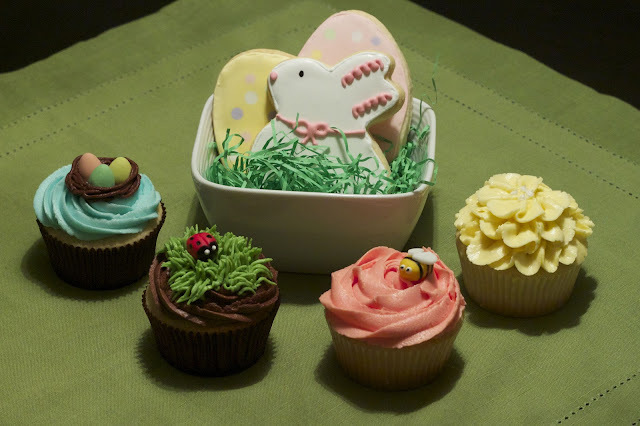 Last week I wrote a post about Spring and Easter themed cupcakes and cookies that I had made for a bake sale at work. 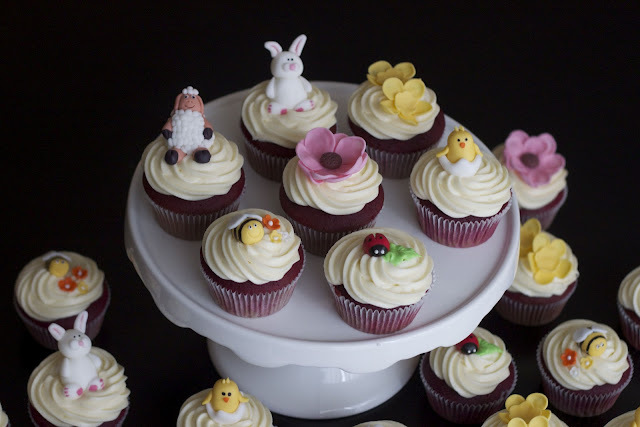 I got to do a bit of a reprise this weekend as I was asked to make some Easter themed red velvet cupcakes for an Orthodox Easter gathering. As this was for a family gathering, I wanted to make sure that I had some very kid-oriented designs as well as some more elegant designs for the adults. I did a couple of repeat characters from last week (I loved the little bees and ladybugs) with a little bit of a design change and decided to try out some different flowers and animals. 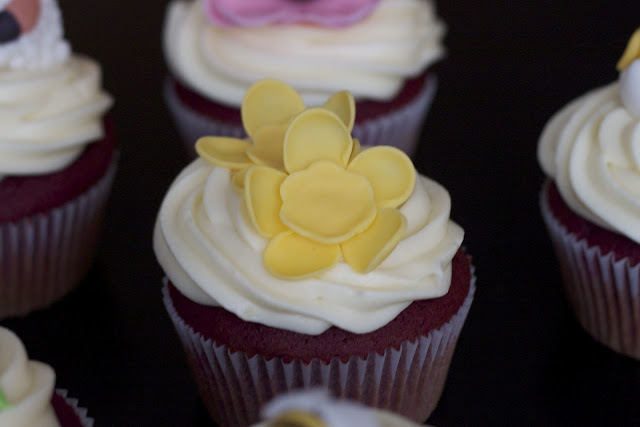 As cream cheese frosting is a bit too soft to pipe flowers with, I made all of the decorations from modelling paste. 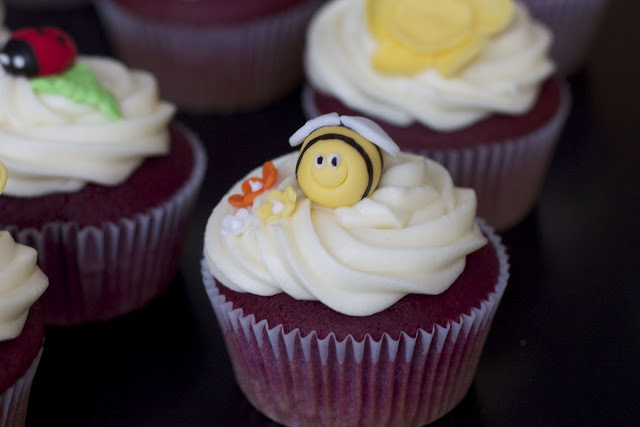 This little bumblebee made the cut from last time. I decided to make them a little bigger so that the smiley face was more noticeable. I used small blossom cutters for the flowers and piped the centres with royal icing. I also made the ladybug bigger and indented the back more noticeably to give the illusion of the wings. Rather than piping grass I decided to make it clean and simple and piped a little leaf using royal icing. 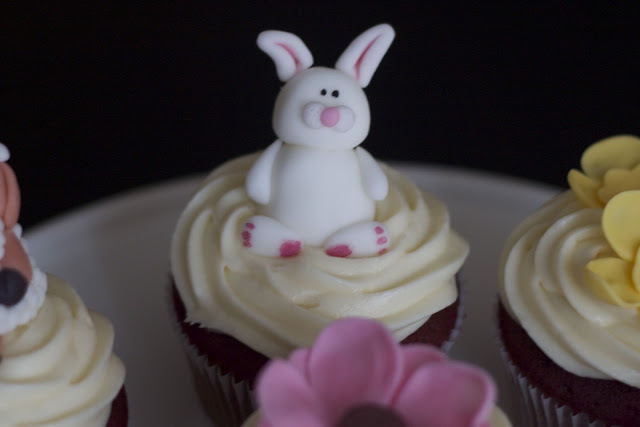 And what is Easter without bunnies? These little guys were very simple to make. I forgot to take a picture of the back, but I made a little fuzzy tail by attaching a ball of modelling paste and then snipping it with a pair of scissors to make it look fur-like. As with bunnies, eggs and chicks are also often associated with Easter. 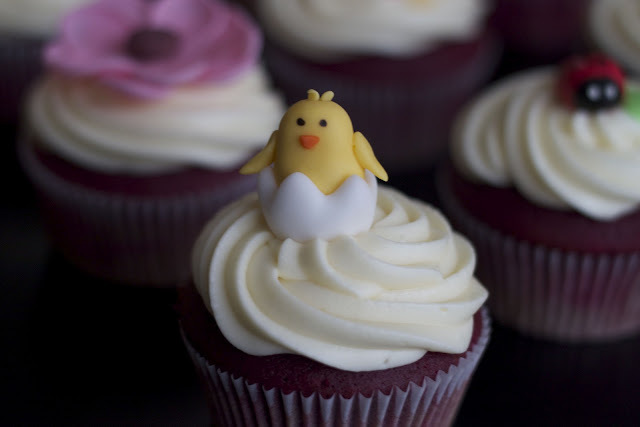 I found these adorable and easy to make chicks on a blog called Learn2Cook where you can find other really cute and simple Easter-themed fondant figures. 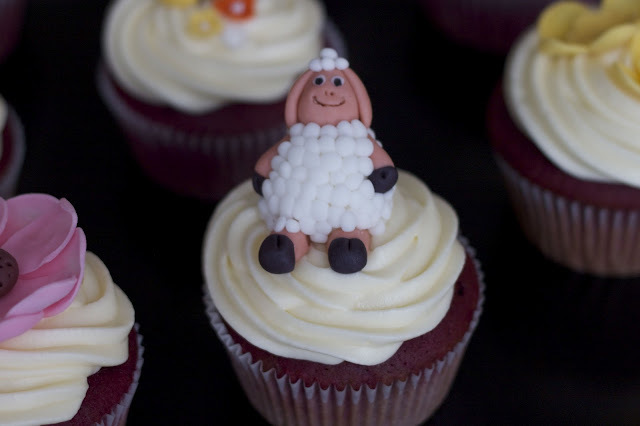 I only made two of these little lambs which appear in the book Cake Art. I find that I have a lot of patience when it comes to figure modelling and attention to detail. I have to admit, I was going a little crazy by the second one while covering the whole body in little modelling paste balls. Maybe I was just tired. I had to wonder whether they actually took the time to cover the back of the lamb for the photo in the book. Just for the record, I did. I did two types of the flowers. The first flower is a pink poppy-like flower. The second is a buttercup type flower. And finally, one last group shot. Happy Easter to all of those celebrating this weekend! When I was asked to make a Toopy and Binoo cake, I must admit that I had to Google the characters to find out what they were. When I discovered how cute they were, I eagerly accepted the challenge. 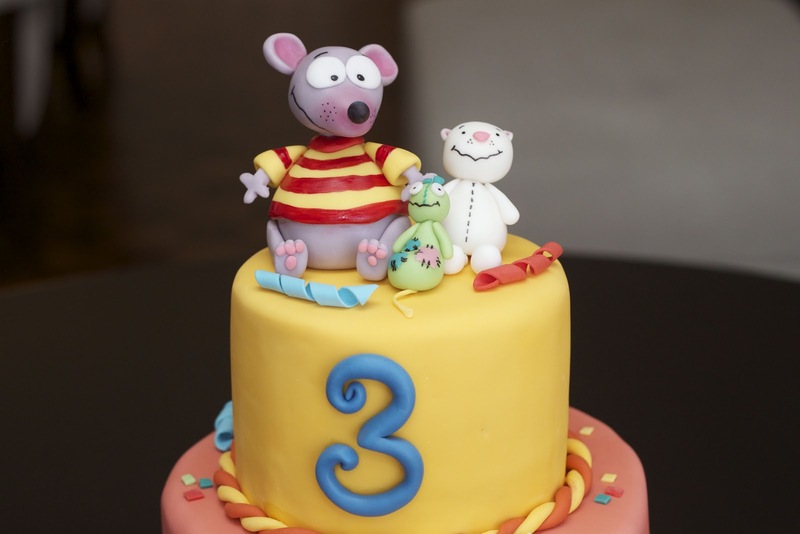 This birthday cake was for a 3 year old boy. I was given a few pictures as ideas but I was also told to put my own spin on it for an original creation. 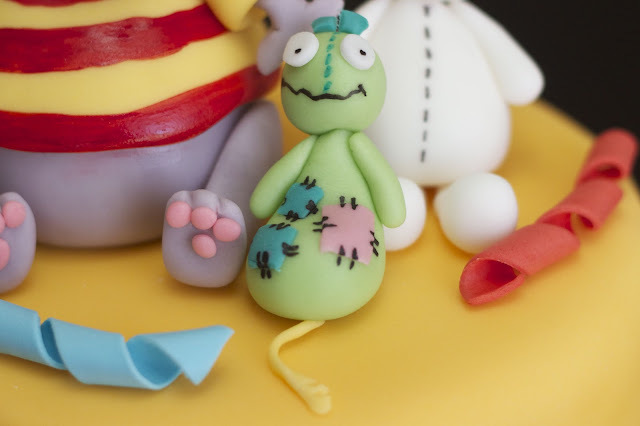 I wanted the cake to be fun and colourful like the show. I did some research by watching clips on YouTube. I saw a jungle theme, clouds, bubbles, island themes, you name it, but I could not find anything that would inspire a birthday cake. I then came across a DVD cover for an episode called Binoo's birthday. Perfect! It was colourful, there were streamers and bubbles and stars. 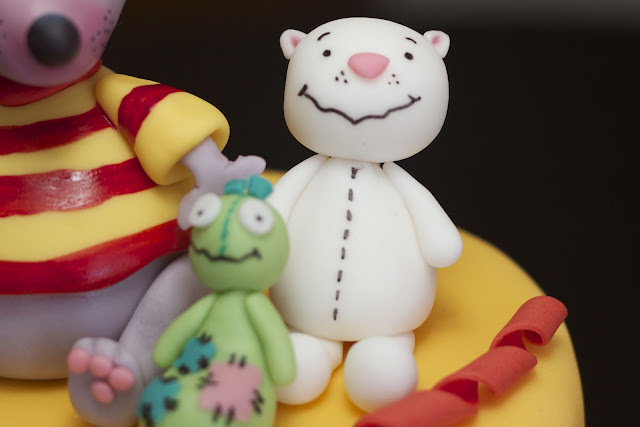 The characters are made from modelling paste made with fondant and tylose. 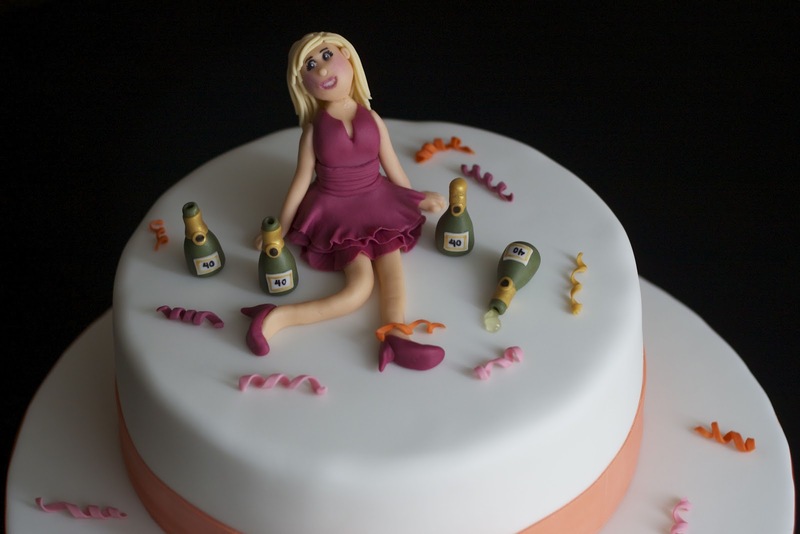 Details are painted on with petal dust (powder food colouring) either dry or mixed with a little vodka. I also use edible marker for some of the details. 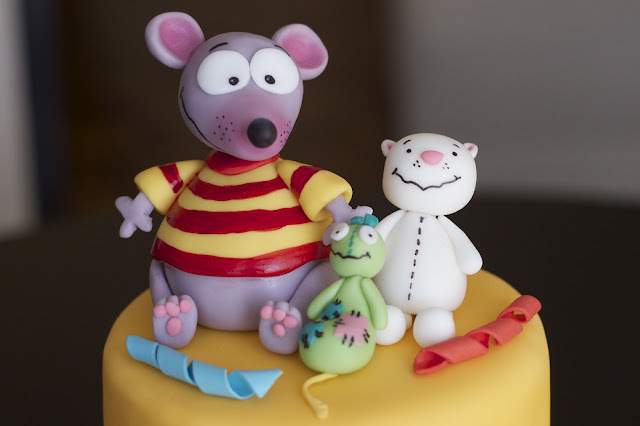 I was asked to make a cake with Toopy and Binoo on it but as I was making it, I felt that it wouldn't be complete without also including Patchy Patch (Binoo's plush doll companion). I made the streamers using gumpaste. The number '3' is made from modelling paste. 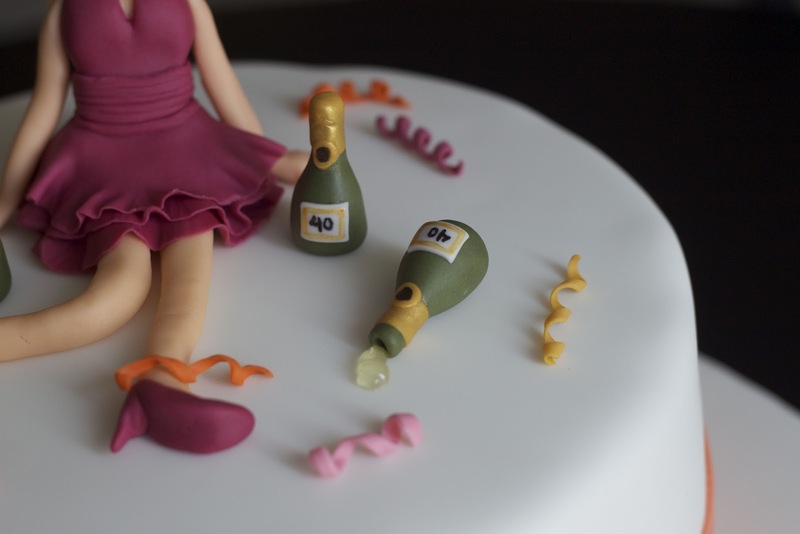 I find that it is easier to work with to create a nice number (the gumpaste dries too fast). You just have to ensure that you leave enough time for the number to set. Both the twisted rope border and bubble border are made with modelling paste. For the bubbles, I tinted the paste with a hint of blue colouring and also finished them with lustre dust for a bit of sheen. The cake is chocolate filled with chocolate swiss meringue buttercream and crumb coated and masked in vanilla. This cake took quite a few hours to make and along the way I did have my doubts as to whether the colours would go well together, especially after I had covered the cakes in their respective colours and they were sitting side by side without any decoration. It all came together in the end and I was really happy with the finished product. It was bright, colourful and fun just as I had hoped it would be. Spring is finally in the air, and in my kitchen! As much as I enjoyed many of the winter-themed treats I made in the last few months (my favourite being the penguin cake), it's nice to bake something light (I don't mean calorie-wise), fresh and pretty. 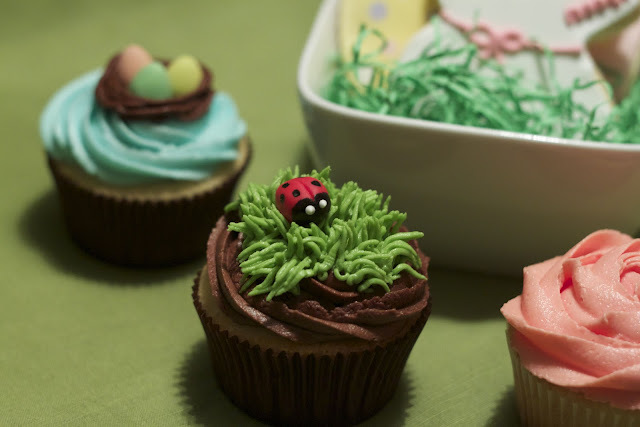 These spring-themed cookies and cupcakes were for a bake sale at work. Now, when I decide to make something, I rarely take the most simple route. 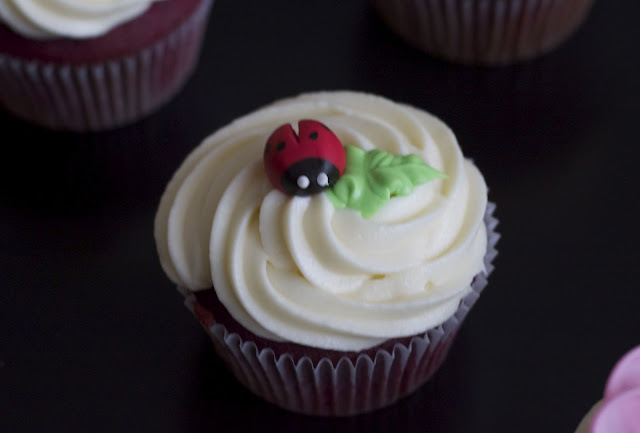 When making a fair quantity of baked goods for such things as bake sales, it makes most sense to focus on one type of treat. My problem is that I like variety. This does not pertain only to sweets. It permeates my love of food, shoes, purses, you name it. It has been quite some time since I've done decorated sugar cookies. Decorated cookies were kind of my starting point for my love of baking and decorating. Several years ago, I made cookie bouquets as the favours for my sister's bridal shower. It was not without its challenges. I remember taking the cookies out of the oven and the parchment paper slipped off of the pan. The cookies fell to the bottom of the oven, the paper hit the element and caught fire and while putting the fire out, my family's labradoodle took the opportunity to lick the side of the cake that I had been writing a celebratory message on. 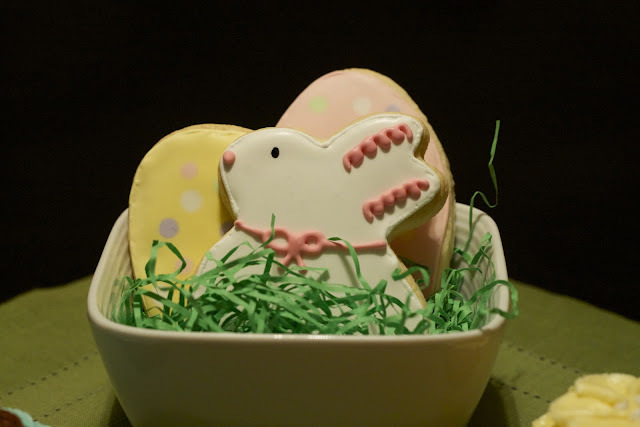 I am happy to say that I only had one cookie casualty with these ones. In the past I've used the Wilton roll-out cookie recipe. The flavour is nice and you don't need to refrigerate the dough. The cookies do turn out less sturdy than regular sugar cookies though, and since I was transporting and packaging these cookies for a bake sale, I decided that a traditional sugar cookie recipe would be better. I used the Martha Stewart sugar cookie recipe. I found the dough was easy to work with. I rolled my cookies out 1/4" thick rather than 1/8" in because I think the thicker cookies look nicer when decorated. I used royal icing to outline and flood the cookies. 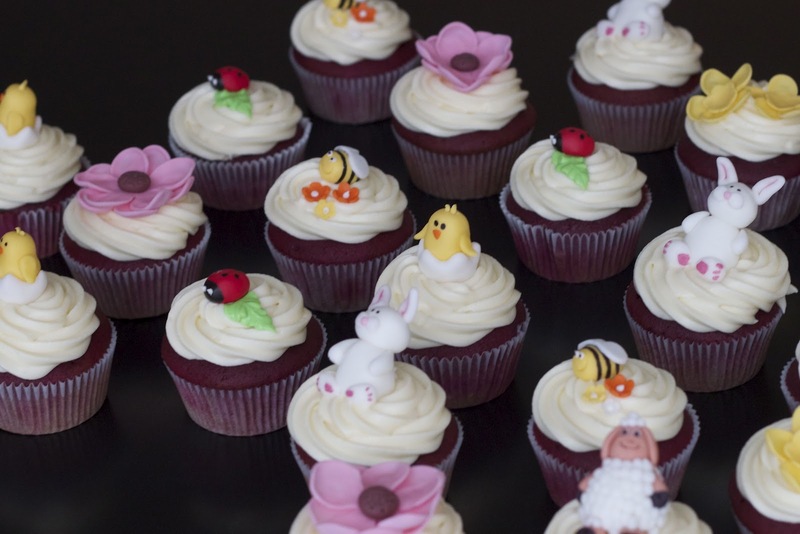 For the cupcakes, I did four designs using various colours of frosting: a robin's egg nest filled with mini eggs, a chocolate-frosting covered vanilla cupcake with a fondant ladybug, a pink vanilla 'rose' (i.e. 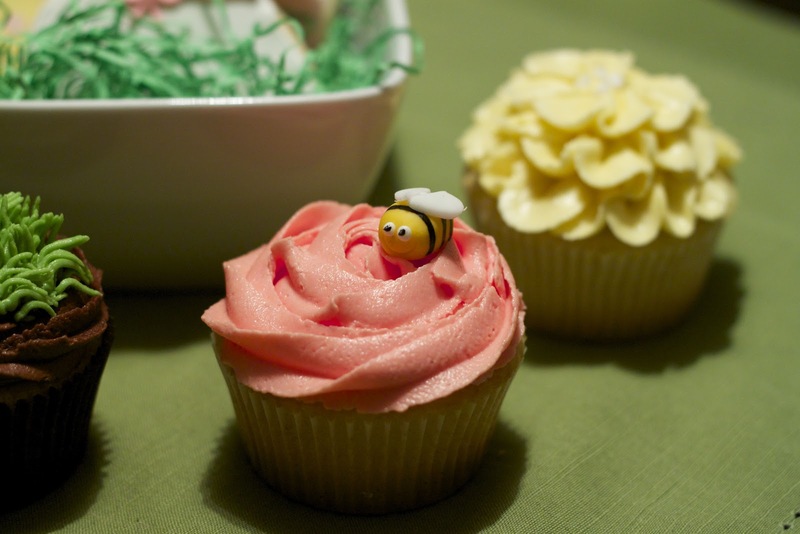 backwards swirl) topped with a fondant bumblebee, and a yellow vanilla zinnia. It has been at least a year or two since I've piped flowers. I originally wanted to pipe roses but I had made my frosting too soft for distinguished petals, so I made the zinnia's instead. 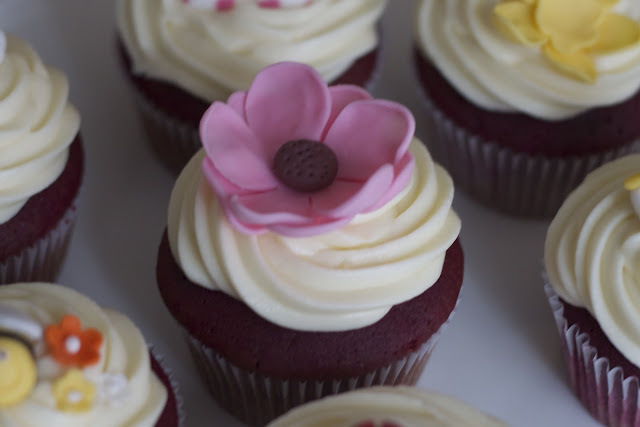 The frosting was still too soft for these but the petals are smaller with less weight so I thought they still turned out alright.